← So Who Wants Hillary Gone? One of the most brain-damaged failures of the greenhouse gas vatican, is their ongoing refusal to accept that the temperature on Venus is controlled by the atmospheric pressure rather than the composition of the atmosphere. 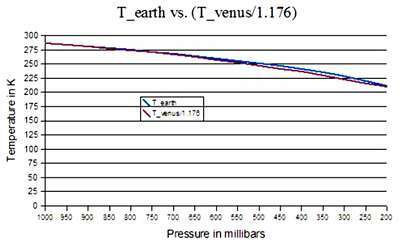 The lapse rate on Venus is similar to Earth, despite very different chemistry. If greenhouse gases controlled the lapse rate, the humidity (amount of greenhouse gas H2O) would have a large effect on the dry lapse rate of Earth. It doesn’t. The bottom of the Grand Canyon is hot for the same reason that Venus is hot. The atmospheric pressure is high. Venus and Mars have the same atmospheric composition. Venus is hot, Mars is cold. It is the pressure, stupid. What happened to the atmosphere on Mars? Why does Earth and Venus atmosphere and Mars has a tiny one. Mars has a much lower gravity and lost it’s atmosphere. The Earth also has atmosphere stripped off continuously. Mars also has an extremely weak magnetic field so solar wind is especially brutal at stripping gas away from it. We’re still living on that churned up iron core that got a boost when Theia whacked us and formed our moon. That additional energy delayed our atmospheric loss by some amount of time. It will still happen, but much later thanks to that collision and the moon’s orbital energy keeping our core moving around. They have re-posted this article in their feed. What can be done about “pseudoskeptism” including the climate change deniers. An entire new climate epoch to be blamed on man? What’s wrong with the solar cycles? Way too exact for the CO2 whores. And it will be their downfall. Eventually. And they’ve got a classic ‘hockey stick’ temperature anomaly to prove it. When will that thing die? Thanks Neal, another reason not to read Sciency American. Every sentence contained errors a smart 8th grader could spot. 1610, their new era of Anthropocene. “Placing the Anthropocene at this time highlights the idea that colonialism, global trade and the desire for wealth and profits began driving Earth towards a new state,” argues ecologist Simon Lewis of Leeds University and the University College of London. Thanks got it. So, Mars gravity is weaker to the point where atmosphere slowly escapes. Wow, Mars could never be a colony. You would always need a suit to go outside. It depends on what timescale you are looking at. I once read an article dealing with a fun thought experiment. If you had enough air on our Moon to make one standard atmosphere of pressure, the air would leak inti space due to the Moon’s low gravity. How long would it take for the lunar atmosphere to fall to half pressue? A week? A year? A century? The author had done the math and IIRC the answer was about 2,500 years. Of course Mars would work much better than the Moon. Science fiction readers can get a lot of information about the Martian atmosphere and what it would take to “terraform” it from Kim Stanley Robinson’s Mars trilogy. Of some interest is the idea of capturing large amounts of oxygen and water from asteroids. Unfortunately, Mars’s subpar magnetic field would make life rather difficult. The more interesting point is that as Earth continues to shed atmosphere, we may well want to replenish in much the same way. I have wondered in the past just how much the atmosphere of Earth has changed in the last, say, 100,000,000 years. There seems to be a fair amount of information (maybe speculation is a better word) about how the composition has changed — but surprisingly little that I could find on how the actual pressure and density have changed. I suspect that the air pressure 100,000,000 or even 50,000,000 was considerably higher that at present. It would certainly explain how the Earth had such large insects (much higher oxygen diffusion through the tracheoles) and such apparently poorly designed flyers as the pterodactyls. High density means even a poor wing would fly. Here are a few fascinating correlations for the Hopey-Choomy types to rail against : http://www.tylervigen.com/ I like the 3rd one down. Time to ban cheese!!! btw: Mars’ low gravity may have a lot to do with the loss of it’s atmosphere. That does leave the question of why Venus has such a massive atmosphere compared to earth. Magnetic field strengths? I really don’t know enough to speculate. On earth, most of the CO2 is trapped in limestone. If it were all released we would have a similar atmosphere to Venus. The difference is that we have oceans. Sorry, what is lapse rate? The amount of gas that is lost to gravitation versus the amount of gas that is gained/recovered by gravitation? For a given mass of gas, lower pressure = lower temperature. Since the atmosphere is a gradient with lower pressure as you rise, all other things being equal, you would expect the lower altitudes to have a higher temperature. And life, which actually produced the limestone. I learned a lot just with this one post. Thanks Tony. Uranus has very high atmospheric pressures, and this make Uranus very warm !!! Yes. Uranus is hotter at the base of its troposphere than the Earth is at the bottom of our own TLT. Venus also rotates on its axis at a glacially slow pace. There is nearly nothing to compare our planet with it. Except that at equivalent atmospheric pressure to Earth, Venus is almost EXACTLY the temperature it should be given its relative distance from the Sun.. Particularly when probes have validated this with actual measurements. Yet, the Greenhouse Gas theory and Trenberth’s fictional diagram still hold prominence. It is like “climate scientists” are kittens and the IPCC is a flashlight moving around quickly on the ground. What is the source of your chart. I would like a quality version of this with source noted rather than writing a description of the fact that the Venus lapse rate from 1 bar up closely follows that of Earth’s. As Steven / Tony said, its the atmospheric pressure. My 14 cats take offense… they’re much smarter than IPCC bureaucrat could ever hope to be… and they don’t molest women either. The source data comes from the US Standard Atmosphere (that has been used by the aeronaughtics industry for about 40 years) and Magellan probe that went to Venus back in 1991. Isn’t this what Harry Huffman has been saying? I believe there’s disagreement between Steve and Harry; anyone care to shed light on where there’s disagreement? The problem with Huffman’s claim of a direct temperature equivalence between the 1 bar layers in the atmospheres of Venus and Earth, is that he doesn’t account for the huge difference in global albedo between the two neighboring planets. He only considers pressure and distance from the Sun. But a celestial body at 0.723AU doesn’t necessarily absorb* a solar flux 1.91 times more intense than the solar flux absorbed by a body at 1AU. That all depends on the global albedos of the bodies in question. The Moon, at 1AU, absorbs a mean solar flux ~23% more intense than Earth, also at 1AU, only because of a lower global albedo. *We all know that solar heat will have to be ABSORBED in order to affect temperatures. Reflected sunlight does not heat the reflecting surface. Taking albedo into account, the Venusian 1 bar layer should’ve been significantly cooler than the equivalent terrestrial 1 bar layer. But in reality it’s considerably warmer. Huffman updated the post in 2012 showing that “correcting for albedo” is also bad physics. The layer of atmosphere of Venus that Huffman is using is mostly above the cloud layer which kind of makes the albedo of the planet’s surface largely irrelevant anyway. Oh, did he really? But then it’s all A-OK, then, isn’t it? Truthseeker, Huffman didn’t ‘show’ anything. He ‘asserted’ it. It is the practice of NOT correcting for albedo that’s ‘bad physics’. It’s called ‘confirmation bias’. You choose away the inconvenient physical factors that don’t fit in with your hypothesis. And then you just start frantically waving your hands when someone points them out to you. Which is precisely what Huffman is doing. The albedo makes all the difference. Because it determines how much solar heat is ACTUALLY absorbed by the planetary system. Again, only absorbed heat affects temperature, not reflected heat. Say what!? You can’t be serious! “Is there anything the government doesn’t ruin? sorry for the duplicate. WordUnimpress as been really whacky for the last week or more. Is it fair to say that mountain tops are cold for the same reason… Less atmospheric pressure? Yo also need to look at the latent heat of evaporation since water makes up ~ 4% of the atmosphere. Lots going on in the earth’s atmosphere. I am trying to make sense of “lapse rate”. Can someone help? If you drive up a mountain, it gets colder. The temperature drop per unit elevation is the lapse rate. Lapse rate is the gradiant at which the atmosphere cools with altitude. It is calculated as = specific heat/gravity. Basically, the different phases of H2O are the main modifiers of this lapse rate, so the wet lapse rate is around 5.8ºC/km (iirc) up to the cloud ceiling. Atmospheric CO2 has an infinitesimal effect on laspe rate because its specific heat is very close to that of normal air. Dry lapse rate applies any time there isn’t condensation occurring. It isn’t affected much by humidity. Yep, sorry, been a few years since I studiesd that stuff. Chilean Mummies are turning into black goo from “climate change”. Humidity increasing in the Atacama area. And the Wicked Witch of the West is melting into black goo due to Dorothy dumping global warming water on her! Ummm, they’re no longer in the Atacama desert, they’re in a museum next to the ocean. I wonder where the humidity’s coming from… any ideas? Oh, and all the bacteria that are destroying them are from the people wandering around in that museum, next to the ocean with all the humidity where the mummies are since they haven’t been in the desert for 10 YEARS. Of course I’d be blaming all of this on “Global Warming” as well. What a crock of sh!t. Oh, and after looking on the a map and finding the University Museum it is about 120 meters away from the Pacific Ocean… unless they are housed on the far side of the campus in which case they are 200 meters from the Pacific Ocean. Yet another “Global Warming” disaster hoax… Quelle Surprise! lol, emsnews. thank you for the laugh! that indeed is the money quote. someone is looking for a “climate change” grant for the “Save The Mummies” campaign. Sorry to disappoint you, but presence of atmosphere as such can not make the surface hotter than otherwise. The most simple explanation is this: if we assume it does make the surface hotter, then it will radiate away more energy (S-B law) than it receives from the Sun, which is physically impossible. With you all the way on adiabatic warming. The question is, how much? My friends, CO2 is not a magic molecule that drives our temperatures on the earth. It is a plant food that allows life as we know it to exists. I would like to see much more CO2 in the atmosphere — better for growing crops to feed the over 7 billion people on the earth. CO2 ….. the molecule of all life on Earth!!! I rather see 1500 ppm. The plants would be much much happier and the deserts would green because less water would be lost through the stomata. We exhale 40,000 ppm of CO2. They want us to stop breathing. perhaps it’s time to kickstart a company to make what soon will be the mandatory flatulence filters for the human menace of CO2 and Methane released gases. The presence of a vertical temperature gradient (lapse rate) in a gaseous atmosphere is proportional to the gravitational constant and inversely proportional to the heat capacity of the gas. It is called the Loschmidt Effect. It is occurs even when an atmosphere has no greenhouse gases, such as the Sun. It is simply an expression of the conservation of energy in the presence of a gravitational field. The IPCC scientists reject the Loschmidt Effect. They say the Earth’s effective temperature is 255 K and claim that without any greenhouse gases, the surface temperature will also be 255 K. They claim that without greenhouse gases the Earth;s atmosphere would have a uniform temperature from top to bottom. They then claim that adding greenhouse gases increases the Earth’s surface temperature to 288 K, or makes the surface temperature 33 K warmer. The 33 K number is completely bogus. It vastly overestimates any effect greenhouse gases have on the temperature at the surface. The entire greenhouse gas scare is based on a wrong number. Because of the Loschmidt Effect, the actual greenhouse effect is much smaller and is rather close to zero. 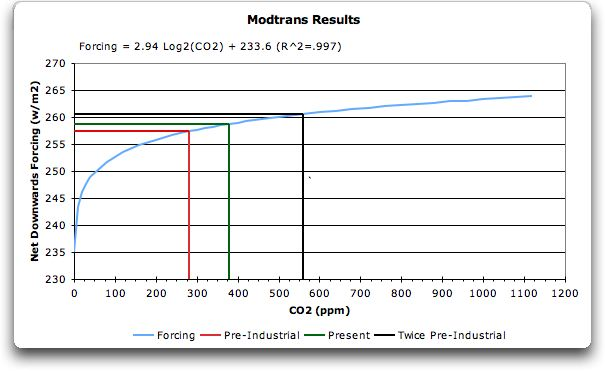 a thermodynamic study says the entire CO2 effect is about 3 degrees C for 380ppm. You would have to double the ppm to get another 3 degrees. Not sure if the 3 degrees is correct as I didn’t run the numbers. The CO2 effect is not linear – it is logarithmic. If the warming was 3 C for 380ppm, a doubling would create a further warming of about 0.3 C. You are off by a factor 10. Logarithmic to what base I might ask? There are natural logs, logs base 10, and you can be logarithmic to other bases as well. Just saying something is logarithmic is giving about as much information as saying two things are proportional. One might ask ‘what is the proportion?’. Based on what you have written indicates to me that you think the base of this logarithmic effect is 10. There is a lot in nature that knows nothing of our base 10 number system. According to AR3, it is dT=5.35ln2((C2-C1)/C1). That is log base 2. The 5.35 number ignores the Loschmidt Effect, so that portion of the formula is wrong. The only problem is Dr Happer just squashed that curve even flatter because observations do not fit the model it is based on. PV = nRT, now why didn’t I remember that? Oh well. If anyone thinks adiabatic pressure baloney ‘ causes’ heat they are ignorant. All pressure can do is concentrate heat energy. The above article is asinine. Very much mirth reading this. Thanks.